Aaja Chemnitz Larsen is a Master of Science in Public Administration (Cand. Scient. Adm.) from Ilisimatusarfik, University of Greenland, and is further specialized in children’s rights at the Human Rights Law Center of Nottingham University. In addition, Aaja has completed a management training at INSEAD. Aaja has been a member of the Parliament of Greenland for the Inuit Ataqatigiit party since 2014, and a member of the Parliament of Denmark since 2015. In both parliaments, Aaja has worked specifically to strengthen the welfare of Greenland and increase growth through trade with the outside world, as well as strengthening Greenland’s international relations. From 2012-2015, Aaja was a children’s spokesman in Greenland’s self-government, and from 2006-2008 she was the director of welfare management in Kommuneqarfik Sermersooq. In addition, Aaja has been involved in the boards for, among others, Better Child Life, Great Greenland, Statistics Greenland, Institute of Human Rights and Child Council in Greenland. 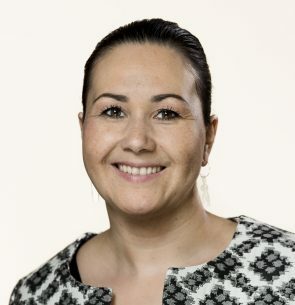 Aaja Chemnitz Larsen has also served as Deputy Chairman of the Board of Transparency International Greenland as well as Chairman of the Greenland Human Rights Council. In addition to her political work, she is voluntarily active in Red Barn Greenland, Greenland Legal Aid and POLAR School, and in 2013, she received the Red Children’s Children’s Rights Prize. Welcome to the opening session of the ICCH 17.